Home > U15’s – The Celebrities of UWH. U15’s – The Celebrities of UWH. It is an exciting time to be a junior in the Australian underwater hockey community. The development of junior involvement both at a national and international level has risen substantially over the past decade, and continues on an exciting incline. More over, our junior’s are exposed to celebrity opportunities, like those experienced by Caleb Thomas, Perri Adkins and Tom Robinson at the recent National Championships held on the Gold Coast. 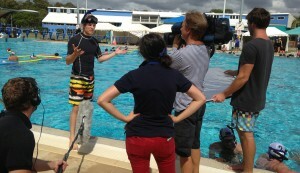 During the tournament, Caleb, Perri (captains of the QLD U15 team), and Tom (captain of the VIC U15 team) were interviewed by host of the TV show Totally Wild. In their poolside interviews, the three captains explained to Totally Wild viewers exactly how our crazy sport works, and why it’s so much fun! 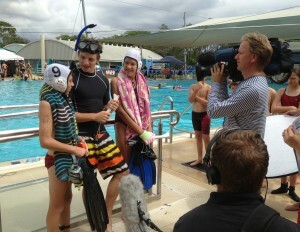 Caleb and Perri (QLD) being interviewed for Totally Wild. Tom (VIC) bieng interviewed for Toally Wild.